The spread of counterfeit military medals – and the fact they are often worn by people fraudulently claiming to have served in the armed forces – is not just a matter of intellectual property infringement, it’s an offence to basic decency. Ahead of Remembrance Day, Carmarthenshire Trading Standards Officer Andrew Passenger and Ministry of Defence (MOD) Patent Officer Sandra Armstrong look at how existing and new legislation is being implemented to preserve the integrity of military badges. Such exaggerated antics leave us in awe, not for their death-defying heroism or their magnificent sense of patriotism, but at the apparent lengths some people are prepared to go to validate themselves with false histories in the face of the real heroism and often tragic hardships that befall members of our military. In the armed forces such individuals are known as ‘Walts’ after the protagonist of James Thurber’s 1939 short story ‘The Secret Life of Walter Mitty’ which begins with Walter fearlessly leading a naval aircraft crew through a takeoff amid hurricane conditions, only to wake from this daydream to find himself driving his wife into town on their weekly errands. For the most part, such fantastic fables are taken with a pinch of salt and such fantasists viewed with a sense of sadness, as harmless dreamers, compensating for low self-esteem or perhaps more disconcertingly, vulnerable people exhibiting symptoms of underlying mental health issues. It is therefore disturbing to recognise that a whole industry exists to serve and fuel such distorted realities, one of the most distasteful aspects of which is the manufacture and sale of counterfeit military honours. Sharp-eyed Carmarthenshire County Councillor Rob Evans brought this matter to the attention of local Trading Standards officers after spotting HM Armed Forces veterans’ badges for sale for £3 on a local market stall. Cllr Evans, a Royal Air Force veteran and proud recipient of the veterans’ badge, was saddened to find that such hard-earned honours, awarded for services to Queen and country, had been reduced to a cheap trinket, freely available regardless of military service. Local officers acted quickly, seizing the offending items on the basis that they were counterfeit. Subsequent liaison with the MOD Intellectual Property Rights Office confirmed this to be the case and the trader was dealt with accordingly. To demean military service in this way will leave many aghast at the value counterfeiters and suppliers place on the service of our veterans, and leads us to question to what ends such items are purchased and used. Last year Carmarthenshire County Council Licensing Officers successfully prosecuted local man Gareth Blyth (pictured left) after he was caught posing in a replica military uniform collecting for a regiment disbanded shortly after the First World War. 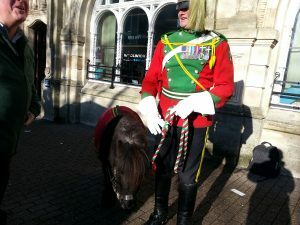 Replete with a bar of medals and a Shetland Pony by his side, the defendant could be found across the county with a bucketful of cash attracting crowds of young parents, children and the elderly. The defendant was subsequently found guilty under the Consumer Protection from Unfair Trading Regulations (2008), sentenced to a 12-month conditional discharge and ordered to pay £5,000 costs. It’s not only IP rights holders and law enforcement who are taking an active interest in such individuals. A secretive online vigilante group comprising a network of serving and ex-services personnel makes it its mission to pursue and expose such charlatans. Calling on the resources and experience of the network, they aggressively pursue suspected impostors with the same organisational precision of our elite special forces units. The Telegraph has reported on two notable scalps exposed by the network: Anthony Church, a formerly respected Oxfordshire town crier, who had 30 letters adorning his name prior to being exposed by the group; and Roger Day, who shamelessly paraded alongside 600 veterans wearing an SAS beret and 21 military medals and badges which experts confirmed could not have conceivably been won by Mr Day. There have been calls to criminalise such imposters and the Awards for Valour (Protection) Bill 2017-19, currently making its way through the House of Lords, is designed to make it a specific criminal offence to lie about military service by fraudulently wearing medals and awards. In addition to the proposed legislation, Trading Standards officers will be aware of their own powerful armoury of criminal legislation to further combat issues surrounding a suspect’s intent in lying about military service and in the trade of counterfeit military honours and associated paraphernalia. So turning to the famous SAS motto, ‘who dares wins…’ – whoever dares manufacture or supply counterfeit medals or wear medals to which they have no legitimate claim may in fact find themselves on the sharp end of criminal and civil law. Please do your bit this Remembrance Day by helping to protect the integrity of Her Majesty’s Armed Services veterans’ badge and the honour of those who have earned it. The HM Armed Forces veterans’ badge was launched in May 2004 by the then Minister for Veterans Ivor Caplin to enable the wider public to identify veterans. The first lapel badge was issued on 10 May 2004 to Lord Healey, a veteran of the Battle of Monte Cassino. This initiated the roll-out of the badge to the generation who served in the second world war. Since then eligibility to apply for the badge has been extended in sequential phases and now all veterans are eligible to apply. Design The badge is an enamelled, engraved and pinned lapel badge featuring the words “HM Armed Forces – Veteran”, which encompasses the Tri-Service, Anchor, Crossed Swords and Eagle motif. Its symbolism is intended to unite all veterans and represent the combined efforts of the Tri-Services whilst encouraging a sense of unity and community among veterans. Eligibility All those who have served in HM Armed Forces, including volunteer and regular reserves, are eligible to apply for the badge. This does not include overseas forces or those who served alongside HM Forces. 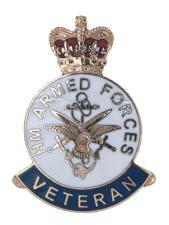 The veterans’ badge is issued automatically to personnel who exit the services as part of their service leavers pack. The badge is a survivor’s badge and therefore is not issued posthumously. The only exception is for War Widows and Widowers who are in receipt of a War Widows/Widowers Pension paid by the MOD. This also includes those who have received an award of Survivors Guaranteed Income Payment (SGIP) under the Armed Forces Compensation Scheme. This is in recognition of the fact that their spouse or long-term partner’s death was due to their military service. Intellectual property rights The UK Armed Forces Veterans’ Badge is a European Union Registered Design Number 000274493-0001. This intellectual property right gives the M0D the monopoly to use this design or any variation of this design. It also gives the M0D the right to stop all others from using this design (as depicted below) and any variation of this badge. This strict control is vital to protect the integrity of the badge and to protect it against misuse. Original badges to this design are issued by the MOD’s Medal Office. No third party has been licensed to produce copies, replicas or variations of the badge: any such copies are necessarily counterfeit, or otherwise infringe the intellectual property rights in the design. However, re-sale of genuine veterans’ badges are perfectly lawful. Infringement of this exclusive right constitutes a civil wrong, for which the MOD can go to court to seek damages, seize profits, or seek an injunction. They can also seek to recover legal costs.